For the next month or so, I will be creating tile for my own home. I’m going to be making a door surround for my front door – a 12″-14″ border that will wrap both sides and the top of the door. I will also be making decorative tiles, back cove, and bullnose molding for a kitchen tile installation. I made most of the field tile about six years ago – about 80 square feet. A big new kitchen window and some new cabinets in my kitchen are a serious incentive to complete the project. I have a slab roller, extruder, and glaze spray booth, all of which will be used to complete the tile. Because my pugmill is filled with the high-fire clay that I use for my production salt-fired pottery, I will not have the luxury of recycling the tile clay with the pugmill. I’ll be working hard to keep waste clay to a minimum in my process. Here’s a picture of my slab roller and its’ attached table, with work in progress. I like to roll my tile out on Slab Mat, a paper product made for the use of potters. I used to use canvas, but always ended up removing the canvas texture from the tile. The Slab Mat also reduces clay dust in the studio, which is good for me and my dog. You can see lots of boards around the table… there are 12″ x 24″ drywall boards for separating and preliminary drying of the tile. 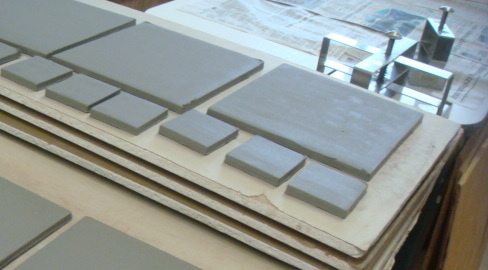 There are also 24″ x 24″ boards which I use for moving tile around and for final drying. I’ve been making tile for about 15 years, but continue to learn. My process is pretty much based around the equipment I own, and I know that there are many ways to make beautiful and functional tile. 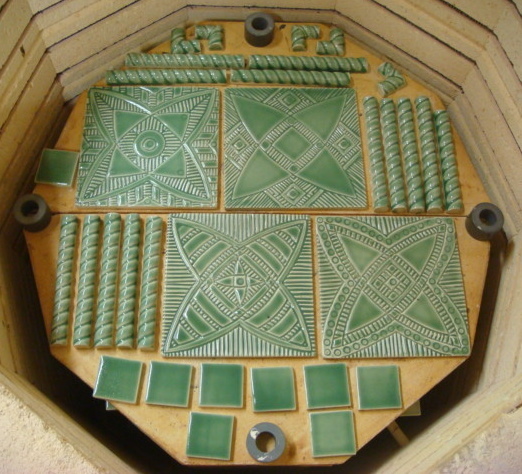 Years ago, I attended a tile making workshop presented by Frank Georgini, and I still consider his tile-making book to be one of the best available. The first step in making tile, for me, is to get the bagged clay to the right stage of dryness. I check the bag of clay, and if there is any sheen of visible moisture, I open the bag and allow the clay to dry a bit right in the bag. Usually I leave the clay bag open overnight… in winter, sometimes longer. I will be using a low-fire talc body for my tile project; one with which I have had lots of experience. Because I have used Seattle Pottery Supply’s LF-06 for a number of projects, I have several glazes that fit it very well. I have found the tile that I have made with it in the past to be durable. And, because winter temperatures are mild here in western Oregon, and since my new front door is tucked back under a covered porch and will not be exposed to the weather, I think that the low-fire tile will be okay for this outdoor installation. I will bisque and glaze fire both to Cone 04. 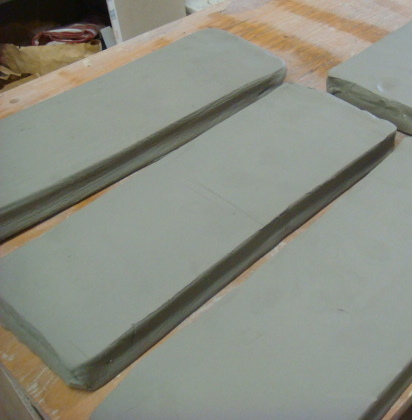 I use a large clay cutter to divide the block of clay into 3 even slices. Here, you can see two bags of clay cut and set on edge to dry. I like to work with clay that is as dry as possible. The drier your clay is when you roll and cut it, the fewer “dings” that there will be on your tile to remove later. The clay should be much, much drier than any clay that you would throw at the wheel. It’s a good idea to keep track of how you divide your bag of clay. 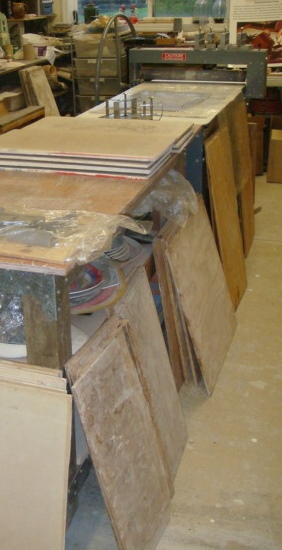 When making tile, a potter should work toward forming slabs that have the smallest amount of waste possible. 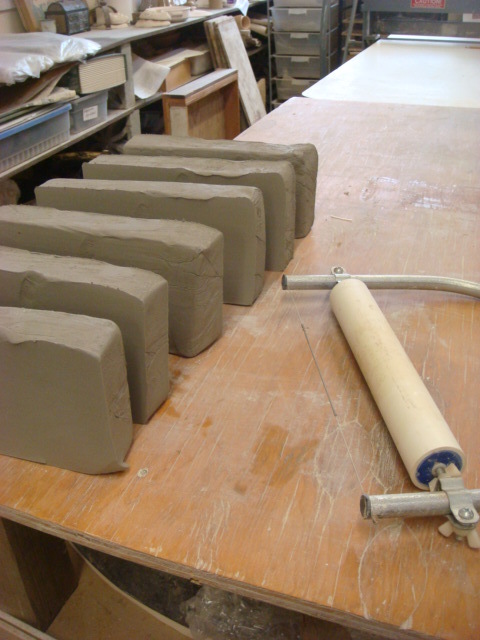 The stiff tile-making clay is simply no fun to wedge for reuse. I cut my block into thirds, then stretch the stiffened blocks to exactly 15″ long. When the 15″ block is turned crosswise in the slab roller, and thinned to 1/4″, I get 6 tiles that are 7.5″ square with less than 1/2″ of waste on each side. I worked all this out after making over 500 tiles of the same size for a mural installation at a local school. Right now, I am just making about 100 tiles for accent use. The main tiles for my kitchen job are 4″ square. Here are some beautiful slabs ready to be put through the slab roller. I’ll be rolling them out in the opposite direction this time – some potters think that this prevents warping of the finished tile. I think that the best way to prevent warping is to respect the flatness of the clay, handle the slabs and tiles as little as possible, and work as dry as possible. I like to cut my tile at the last possible moment when I can force a tile cutter through the slab. 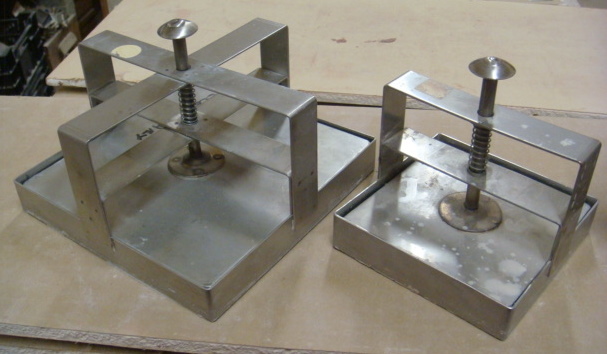 Here are the tile cutters I use… serious tools! These cost $50-60 apiece, and are sold by Georgie’s Ceramic and Clay here in Portland. You can cut the tile and drop it on your tile board without ever touching the tile. Here’s some cut tile on drywall boards to cure. I stack the boards up about 5 high – more than that and I can’t pick them up – and sometimes even wrap them loosely in plastic to slow the drying. Friends of mine go to the trouble of covering the open edges of the drywall board with duct tape to prevent clay contamination, but I have never taken time to do that, and never had any problems with my tile exploding – which is supposed to be what happens when there is drywall dust contamination. And here are some of the final tiles for the kitchen… the installation turned out beautifully! fantastic! looking forward to your next post! can’t wait to see the project progress!